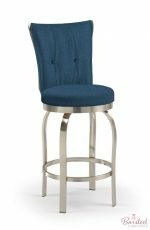 Brushed steel bar stools have a metal satin finish. It’s made by polishing the surface of the metal which creates a signature “brush scrubbed” look. It’s known for its pattern of fine lines that run parallel to the brushing direction. 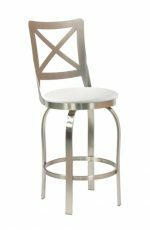 Commonly brushed metals include: stainless steel, aluminum, and nickel. Brushed steel can have a dull or shiny finish. 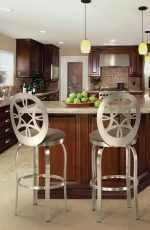 Most of our stools match or closely-match stainless steel appliances with a standard medium-shiny finish, like refrigerators, microwaves, and ovens. It’s an iconic look with the Gateway Arch in St. Louis and the famous DeLorean car from Back to the Future. 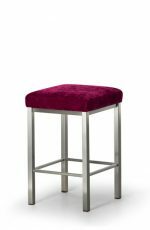 Brushed steel metal stools go great in contemporary or modern kitchens. It compliments most granite, Formica, or Corian countertops. Even better, it doesn’t matter what color or pattern is on your countertop. 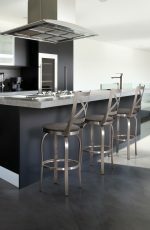 Brushed steel will tie in with your decor and blend with your stainless steel appliances. It also doesn’t show as many fingerprints as stainless because of its buffed pattern. 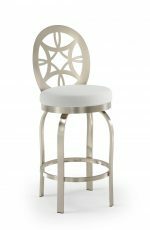 It’s a top-of-the-line finish because it requires an extra polishing process. During this process, the metal is polished with a 120 to 180 grit belt or a wheel, then softened with an 80 to 120 grit compound or an abrasive belt or pad. 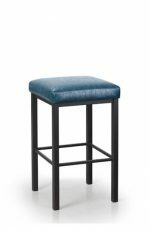 Customize any of our stools with your choice of fabric, vinyl, or sometimes leather, on the seat or back cushion. 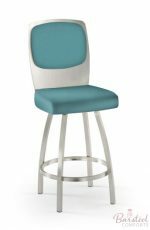 You can also customize your seat height, ranging from 26 inches up to 34 inches, sometimes up to 36 inches! 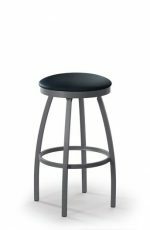 Our stools are available with a backrest or as a backless stool. When choosing your finish, keep in mind that brushed steel is just as durable as any powder-coated paint finish. What’s the difference between chrome and brushed steel? Chrome has a mirror-shine. It’s that mirrored, silvery finish you often see on classic cars. Brushed steel has a “fogged” look and doesn’t have a mirror finish. 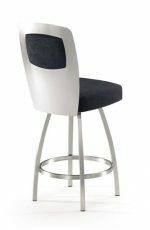 Chrome stools are offered through our Trica brand. Kitchens with a lot of brushed and stainless steel tend to have a modern industrial look, which many people prefer. However, some people feel that too much steel tends to look cold. You can avoid creating a “cold look” by adding warm tones (anything based on red, yellow, or orange) throughout the room. Consider warm tones for your wall paint, stool seats, or lighting, and for accessories such as paintings, flowers, and window treatments. 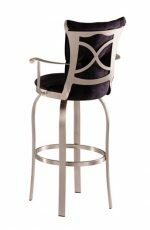 In pool rooms and home bars, area rugs can offer a warm, subdued pattern that balances your brushed steel stools. But in a stainless modern kitchen, too many patterns is a no-no.If you’re definitely looking for that industrial look in your kitchen, use fewer patterns and more solid colors. 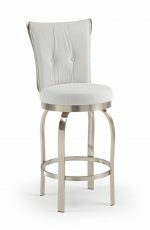 This will give your kitchen a clean and uncluttered atmosphere. For example, choose bare countertops, one or two stainless appliances, and hardwood or solid-tiled floors. 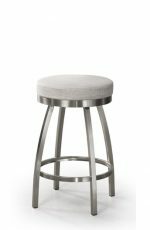 If you have any questions about these stools, let us know! 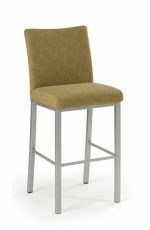 Feel free to send us a picture of your room and we’ll help you pick the stools that fit right in. We also carry a variety of stainless steel bar stools which also match stainless steel appliances.